Nationwide, 10 sites were designated last month as "proving grounds" for automated vehicles by the U.S. Department of Transportation. They include North Carolina turnpikes, the eastern Iowa prairie and a Michigan site where World War II bombing aircraft were produced in a factory built by automobile pioneer Henry Ford. Atlanta isn't on the list, but city officials nevertheless hope to make an impact. Backers of driverless cars say they could be part of a broader effort to rebuild the nation's infrastructure, something President Donald Trump has pledged to do. As roads and highways are rebuilt, "we think it would be very, very wise to build modern infrastructure with 21st-century capability in mind," said Paul Brubaker, president and CEO of the Washington, D.C.-based Alliance for Transportation Innovation. 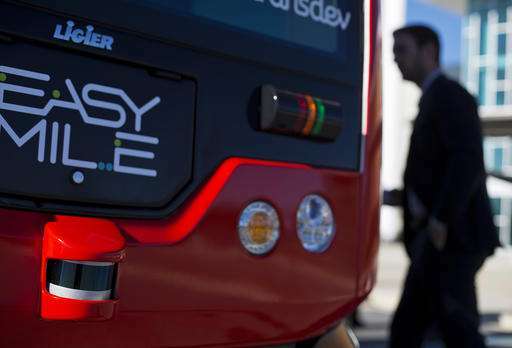 Self-driving vehicles, he said, "should be a national priority." The Trump administration hasn't revealed its approach to the technology, but two U.S. senators this month announced a bipartisan effort to help speed deployment of the vehicles on the nation's roads. 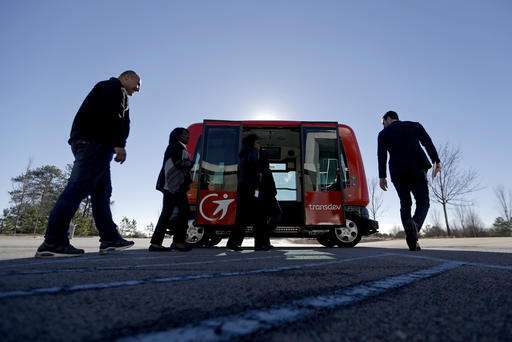 Republican John Thune of South Dakota and Democrat Gary Peters of Michigan said they're considering legislation that "clears hurdles and advances innovation in self-driving vehicle technology." 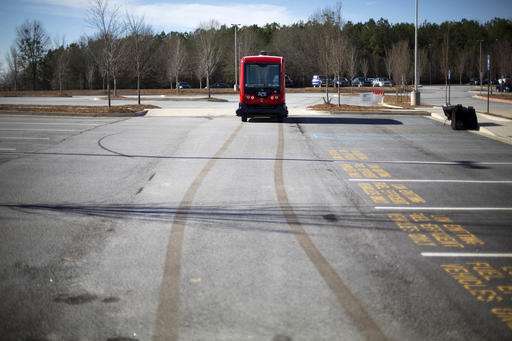 The street, which connects the Georgia Institute of Technology campus to some of the South's tallest skyscrapers, would be among the busiest urban environments yet for such testing. 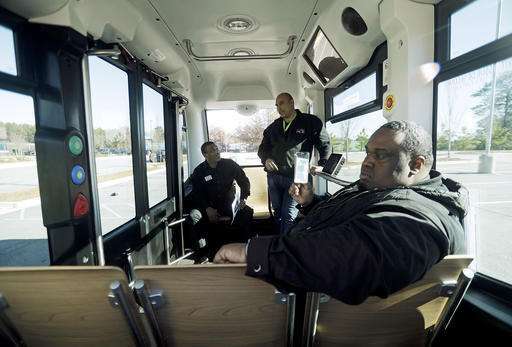 The goal of September's demonstration is to show how such a vehicle would navigate in real-world traffic, though a driver will be inside and can take the controls if needed, said Faye DiMassimo, an Atlanta official involved in the North Avenue project. "We still think that autonomous vehicles are sort of 'The Jetsons,' right?" DiMassimo said. "When you looked at all the information, you realize not only is this here and now, this has been in development for quite some time." "Imagine if these vehicles were hacked. Imagine if the system that controls them were hacked," said Jamie Court, president of Consumer Watchdog. "I don't think our society is going to want a robot glitch or a software hack to be responsible for mass deaths," he said. "If we sanction robots controlling these vehicles without really knowing the risks, I think the technology will go under when the first major catastrophe befalls us." Court's group worked with California transportation officials as they developed rules for testing vehicles developed by Google and other companies. Now, Court and others are watching to see how often human drivers must take over to prevent accidents as vehicles are tested in California. Tying together massive amounts of data from so many sources "will pose myriad security challenges," Atlanta Mayor Kasim Reed acknowledged in a report last year on a related initiative to transform Atlanta into a "smart city." Researchers at Georgia Tech, Reed said, will be key to that effort. 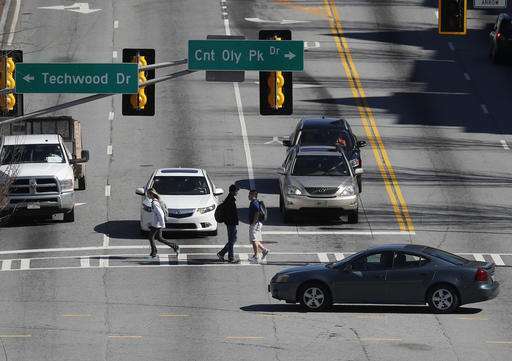 Atlanta's notorious traffic congestion could lead residents to welcome such vehicles, Brubaker said. 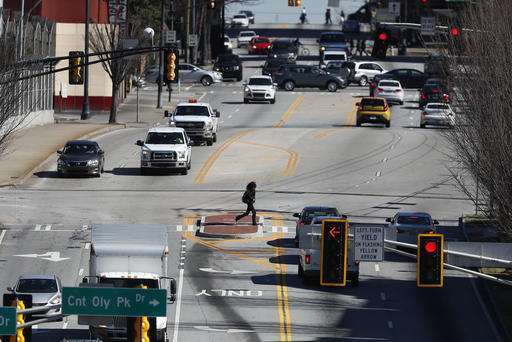 "In any city that has that level of congestion, people have a relatively open mind to embracing technology solutions that will improve the traffic flow," Brubaker said. 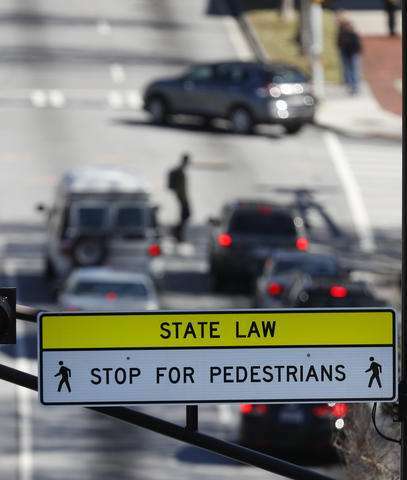 "The technology really is not ready to be used on urban streets, unless they are going to be cleared of human drivers and dedicated strictly to autonomous vehicles," Court said. "The real problem is these technologies tend to fail when they're around pedestrians, cyclists, human drivers," Court said. The key obstacle, he said: "human behavior is really unpredictable." At one North Avenue intersection near Georgia Tech's football stadium, "students tend to jaywalk, so it can get a little bit messy over there," said Georgia Tech student Maura Currie, 19. She called it "a hectic stretch of road." The people and companies which make autonomous vehicles really want them on the road and they want them on the road now. The general population is not asking for this. OK, self driving cars are cool and all...but a 'national priority'? That's taking it a bit far. One wonders why there is a 'national priority' to put millions of people out of work. ""Imagine if these vehicles were hacked. Imagine if the system that controls them were hacked," said Jamie Court, president of Consumer Watchdog." -Imagine if some people actually drove drunk. Imagine if they actually tried to drive while texting, while eating hoagies, while slapping their kids in the back seat, while chasing down the other idiot who cut them off at the last light. Imagine how AI cars are going to free us from the dangers of the typical human driver in so many ways. Well unless speed limits are raised on most roads and highways there will be serious traffic jams during rush hours. The self driving cars will be forced to follow the law creating serious congestion and dangerous speed differences . During rush hour commuters drive very fast mostly 10 to 15 mph over the posted limits on major highways. When they are forced to slow down, say by heavy enforcement, the result bad stop and go traffic due to the inability of the road to handle the volume of traffic at lower speeds. Ahaahaaa you are suggesting that lawbreakers make traffic flow more smoothly?? AI cars are constantly aware of everything around them unlike absent-minded and inattentive humans who drive too slow in the fast lane, tailgate, rubberneck, forget their exits, etc. AI cars can travel inches from each other. They will communicate hazards ahead and calculate the best ways to avoid them even before humans know theyre there. And with far fewer accidents and cops pulling over you very excellent scofflaw drivers, interruptions and backups will all but disappear. AI traffic will run like the corpuscles in your veins unlike human traffic which runs like the snot in your nose. Look, I am all in favor of allowing AI cars to have higher legal speed limits than cars driven by you and I. It will induce people to take older cars off the road and reduce accidents. And also the 1-carlength-per-10mph law which is designed to keep idiot humans from rearending each other and which a cop once told me was actually 3-carlengths. The best way to cure a human of tailgating is to lead him or her into the back of a semi making a left turn. AI should have no problem understanding proper follow distance though. Actually the 10 car length rule has been replaced by the 3 second rule. This makes more sense because it takes the speed of the vehicles into account. I drive fast and will get close to a car occasionally in order to pass. I have never been in a highway accident and was hit once making a uturn on a local street. That was my bad! When I drive I do nothing else but drive and look way far ahead. Yah I know. I looked it up too. So you enjoy breaking the law and you have been lucky. So what? What makes you think that a whole street full of people like you means better traffic? Sure. AI also has much better sellf-evaluation skills. These things have already failed. Smart companies are already backing off because the tech just isn't ready this generation. Of course that won't stop companies from lining up for government money wherever they can get it.